What is it about a foggy morning or afternoon that makes everything so tranquil and eerily quiet? It's almost as if that thick blanket of fog gets placed over the landscape to hush everything in sight. I like the rare occasions when a fog rolls into our area, because it creates a certain kind of atmosphere that is unlike any other. Snowfalls do that to some extent, but a layer of fog is much more ephemeral. Taking those afternoon walks around our home while there's fog seems to heighten my awareness of sounds coming from the wildlife. Yes, the weather is cooler and considerably more damp, and yet, it's just perfect for me. With the hectic baking I've been doing these past few weeks and the preparations for those demos at Williams-Sonoma, nothing is more welcoming than a brief respite from the kitchen. Photographing these moments to capture the ambience is a much needed diversion. Stroll through this place I call home and see what a foggy afternoon looks like. It's not exactly San Francisco fog, but it truly is calming and soothing. Up at the edge of the field, those bare deciduous trees look rather dark & mysterious against the white fog. The mown meadow exhibits the most beautiful greens and yellows this time of year. This is looking up the hill from the edge of our house. That beech and those maples to the right of the driveway are already completely bare. The holly trees resting on top of that pachysandra to the left give us what little green remains. Look at that dark landscape which almost engulfs our tiny home. A few trees, including the giant locust right behind the house, still have leaves. It's only a matter of time. The winding driveway gently slopes up toward the street and surprisingly, it has not been covered by leaves on this particular day. 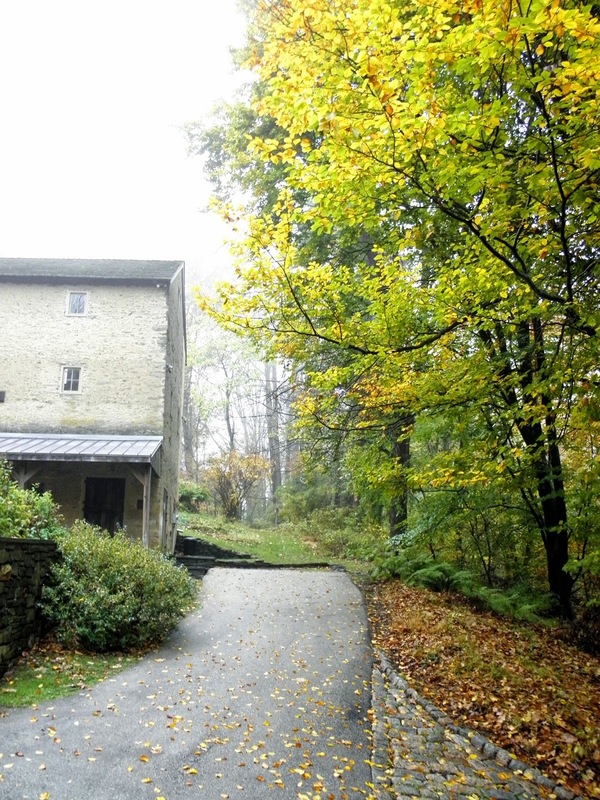 The small driveway next to the barn leads onto an opening to one of the trails. If you take this route you come across a giant magnolia. Come winter, this is going to look completely different. Everything will be lacking in color, except the conifers. This is one of my favorite views ever. A sloped hill, the bank barn and a field just behind it. I'm telling you, it doesn't get any better than this. One aspect of the meadow. A path leading around the edge of the field is caught up in the waves of amber-colored hay. Isn't it beautiful? The barn looks rather lonely sitting there. I hope all of you are having a great Fall and are in the kitchen baking and cooking. Perhaps you're crafting and decorating your house with beautiful seasonal accents. I've been wanting to hang up a wreath on my front door, but do I create one myself or buy one?